In a design inspired by the firefighter pick headed axe, the Cord Wrapped Apocalypse Hatchet is crafted to thrive in survival situations, featuring a sleekly designed head with a sharp cutting edge and a pick. The head is crafted from stainless steel and features a two-toned finish, with the edge done in black and the remainder in satin. Simulated dripping red blood decorates the nylon fiber handle which is green and has black nylon cord wrapped around its ends for improved grip. 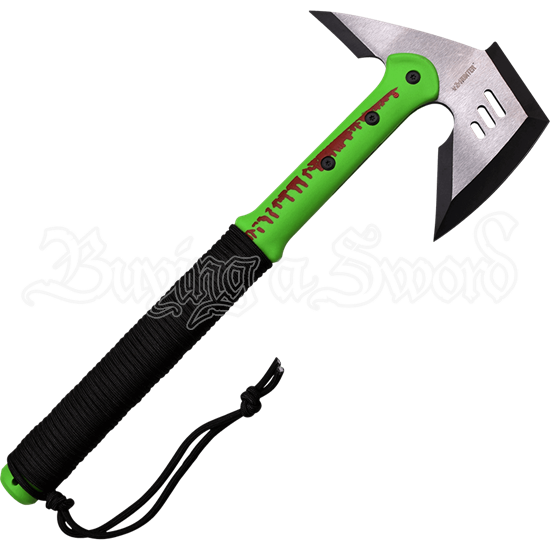 A black nylon sheath is included with this survival axe to allow for its safe storage. Be prepared whatever comes your way with the Cord Wrapped Apocalypse Hatchet.